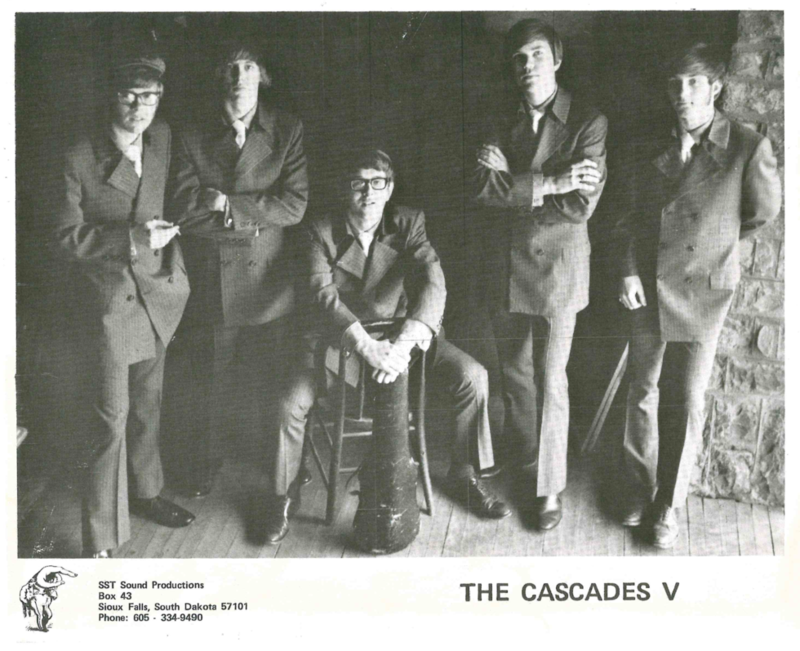 The Cascades V were a regional rock band playing in South Dakota, Iowa and Minnesota during the mid and late ‘60s. The five members, from Sioux Falls, played a wide range of music from light blues to hard rock and progressive rock along with a modified show band act, changing their looks throughout a performance. The band included Gary Fladmark (lead guitar and vocals), Jay Smith (lead singer and saxophone), Barry Sanford (bass guitar and vocals), Frank Burns (organ and electric piano), and Terry Mudder (drums). The band was managed by Steve Thune through his agency SST Sound Productions, which later was taken over by the band. The Cascade V’s wide range of material allowed them to play varying venues while striving to stay up to date. The band stressed vocals and harmonies along with their instrumental abilities. Minnesota, the Surf Ballroom in Clear Lake, Iowa, and the Roof Garden at Lake Okoboji. The Cascades V also worked at the Mocamba Club in Sioux Falls as an occasional fill-in house band and performed at dozens of proms, municipal auditoriums and college venues. The Cascades V established themselves as one of the premier regional rock bands at that time, being finalists competing in local and regional battles of the bands. Burns and Thune are deceased.